Some X Factor fans are just not buying Sam Black’s impromptu Wembley Arena proposal. The 27-year-old plasterer popped the question to girlfriend Emma after getting dropped by judges at the boot camp stage. The audience erupted, and even peppery Simon Cowell looked genuinely moved. Luckily, Emma looked absolutely delighted as she gave him the most important ‘yes’ of the night. Even though Sam put the ring on the wrong hand, the lovebirds were positively glowing as they left the stage together. However, this was one of those telly moments which divide the nation into two camps, very much like The X Factor itself, sort of. The first camp are the old softies whose legs turn to candy floss at such public displays of adoration. The first camp saw a genuine hero, appreciating the love of his life in a spontaneous yet sincere gesture of commitment. It was beautiful, it was innocent, it transcended the dog-eat-dog shininess of The X Factor. He hadn’t even got through but yet he was so happy! Aah the power of love, am I right? Sam black of X factor is so pure?? The second camp encompasses the rest of us curmudgeonly, cynical individuals who can’t believe in anything so pure and natural on this earth. These guys just couldn’t believe the blushing bride-to-be was quite as shocked as she made out. Could this surprise proposal have been somehow ‘faked’? As one eagle eyed viewer noted, ‘That proposal on X factor was cute and everything but did I spot a microphone pack already on her…. ?’ while another commented, ‘I LOVE A FAKE PROPOSAL ON THE X FACTOR’. That proposal on X factor was cute and everything but did I spot a microphone pack already on her….? While some were crying with joy, the more world-weary among us had stronger adjectives to describe their reaction to the proposal. One viewer related how they ‘physically recoiled’, while another said they ‘couldn’t help but cringe’. One person went as far to say this was the reason ‘Europe are happy to see the back of us’. Crikey. Marriage proposal on X Factor. That's why Europe are happy to see the back of us. All friends and family that are sat in the audience are mic’d up as a matter of course, so audiences at home can enjoy their reactions to the auditions. 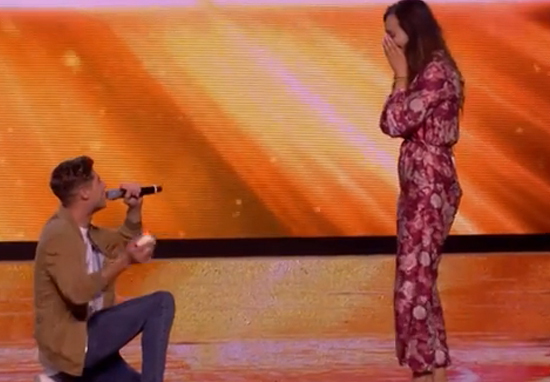 I'm not one for public proposals but Sam Black's proposal on X-Factor though..Ugh…goalss??? Sam Black’s fiancé Emma Smith was completely unaware that he was planning to propose at Bootcamp. I for one am willing to give them the benefit of the doubt, bitter and grumpy as I am. They seem like a super sweet and well suited couple, and it certainly takes some guts to propose in front of such a massive audience, especially after a night of very public rejection. Good luck Sam and Emma, you are going to need a very dramatic and memorable wedding ceremony indeed to top that proposal!